December last year, we saw meta-description space displaying up to 260 characters, in some cases it even went up to 270+ characters. This is because Google went lenient on snippet space, thus offering greater on page optimization options. However, recently it changed its mind and reverted to its pre-December snippet length. Days of witnessing up to 4-5 lines of meta-description on a SERP result are gone. We are back to square one with a 2-3 line, 165 character meta-description days. In a recent tweet by Google’s public relation spokesperson Danny Sullivan, this change was communicated to the world. 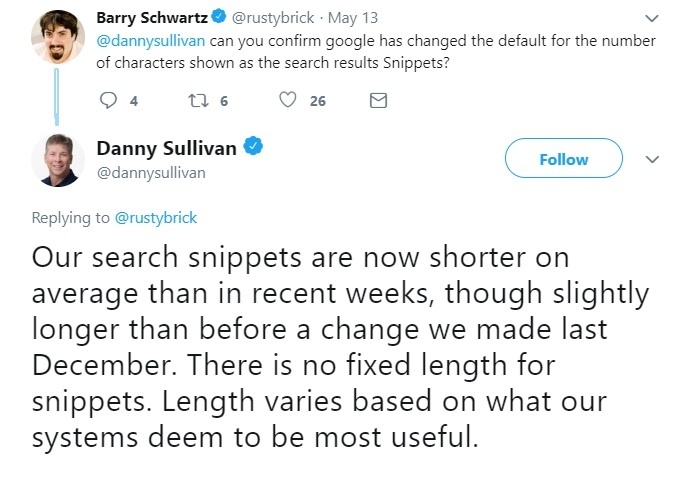 The tweet also made it clear that Google will not be rigid on the snippet but be flexible based on what their systems deem apt. 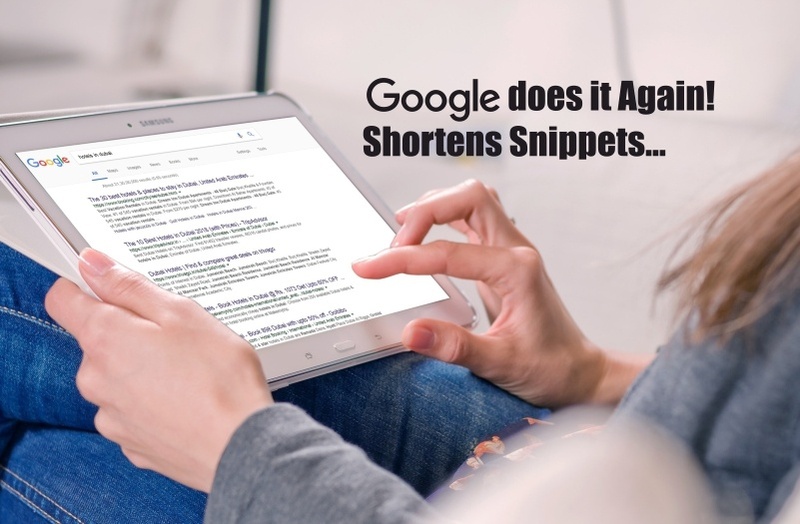 This vagueness in the general length for snippets has put many into confusion. Since, more power has been given to the algorithm, testing this abstraction out looks to be the only out. The primary question ahead of us is how this change could affect SEO. Meta- description is well known to have an impact on CTR. Less snippet space means less or restricted opportunity to elicit a response from search visitors. 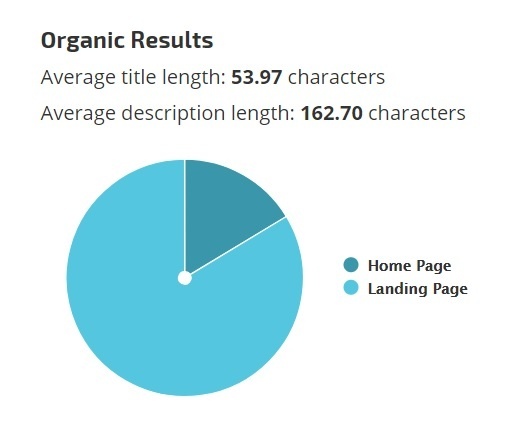 Now, with less no of characters, the best thing that digital marketers and website owners can rely on is to put creative effort in framing their meta-title and meta-description. It is even more challenging when it comes to framing meta-description for the mobile version of your web pages. On mobile, search results display a lesser number of meta-description characters, restricting snippet space even further. According to data available on RankRanger the average length of meta-descriptions globally, as of May 19th, is only 150 characters. This data is for the desktop view. The number reduced even further to only 110-120 characters on mobile view. Learning from this data is the only way out. Making way for all essentials within 120 characters is going to be the status quo and we should only accept it with arms wide open. In summary, simply concentrate on the meta-title and the limited meta-description snippet length with more vigor. We should at least be happy that the meta-title length has seen no reduction from Google. Are there any beneficiaries to this change? Scrolling on mobile view comes from our habits, as a result of this - the new Google limitation is anticipated to have less impact on the website that relies on search visitors from mobile. On the other hand, on desktop view, with less spacing occupying more search result entries, more web pages are going to make it to above the fold space. This gives lower ranking web pages an opportunity to be on par with ones ranking above them. They can simply steal clicks from others if they have really worked on their meta-titles and description snippets. Limitations can only make you more creative and resilient. Take this as an opportunity to optimize your web pages better. It is time for other aspects of SEO - especially the content to take the driver seat in ranking ahead of your competition.